After deconstructing the vintage wool varsity jacket and the baby quilt, I was inspired to check my closet. 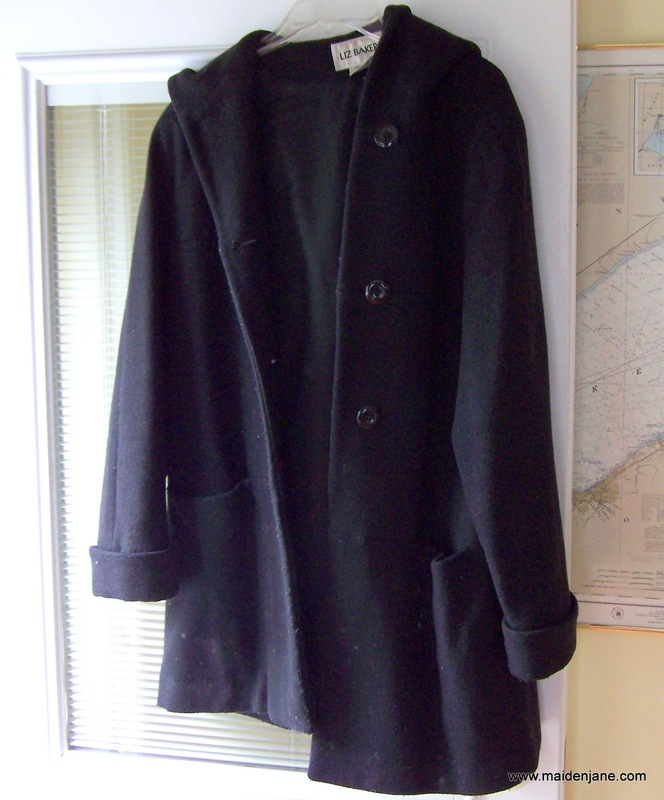 I’ve had an old, wool coat that I was hanging on to for backyard sledding and fires. Well, let’s just say that my “new” coat is in worse shape than this. Sometimes you just have to move on and get rid of the “stuff” in your life! I thought I’d create a messenger bag. There are a number of tutorials, including a great one on OCD: Obsissive Crafting Disorder. I made a messenger bag last year and liked it because I could throw a lot of things in it like my knitting, papers and a laptop. I ended up using it as a purse and found myself always digging through it. I also found that the flap was a constant irritant. 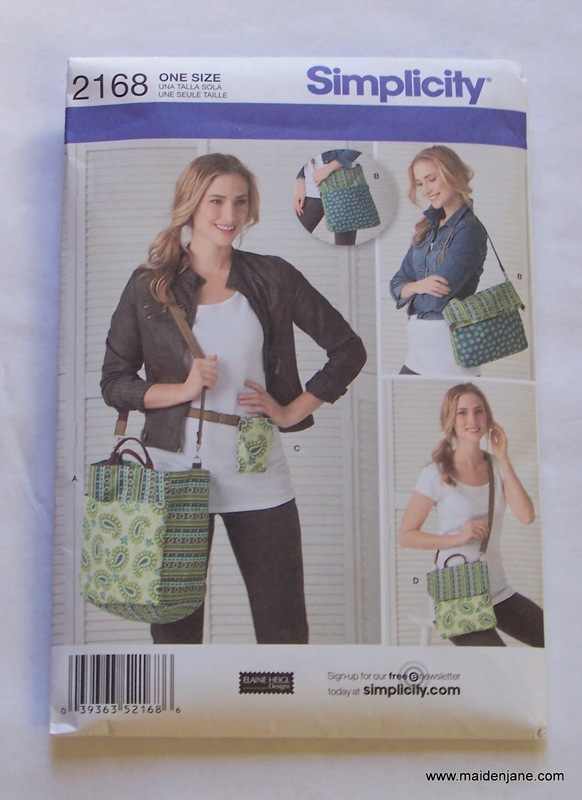 So I went through my patterns and saw this pattern for Simplicity 2168. Bag “B” intrigued me. I felt it had a messenger bag feel. There are two strap locations so it could be used as a long, rectangular bag or a smaller bag with a fold down top. There are no zippers, buttons or anything to get in the way of easily getting out my wallet. 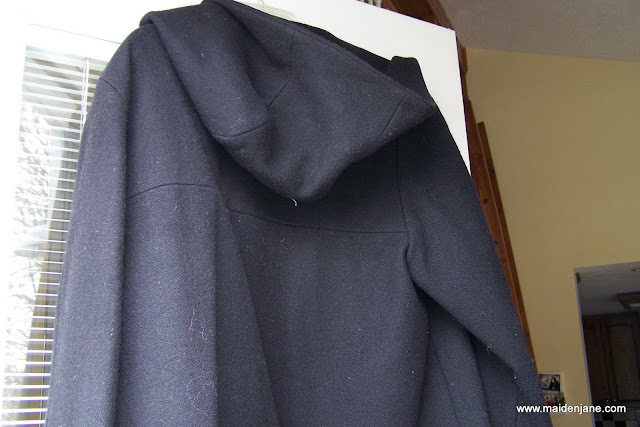 I think I took photos of the coat-cutting process but I can no longer find them. There isn’t a science to it, really. I mainly cut the coat apart to create the largest pieces. If there was a seam, I kept it. In addition, I pieced a number of pieces together to create pieces large enough for the pattern. 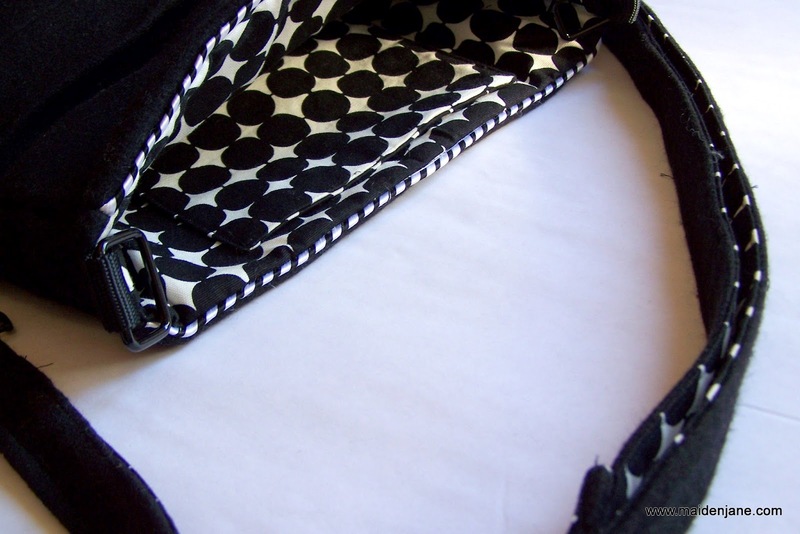 The pattern calls for one large pocket on the outside. 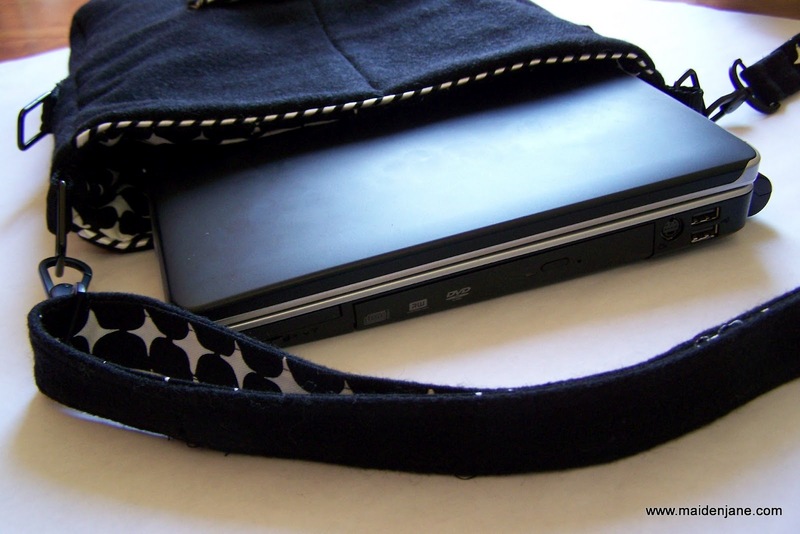 I added a small pocket on the outside for my cell phone, which I can never manage to reach before the call ends. 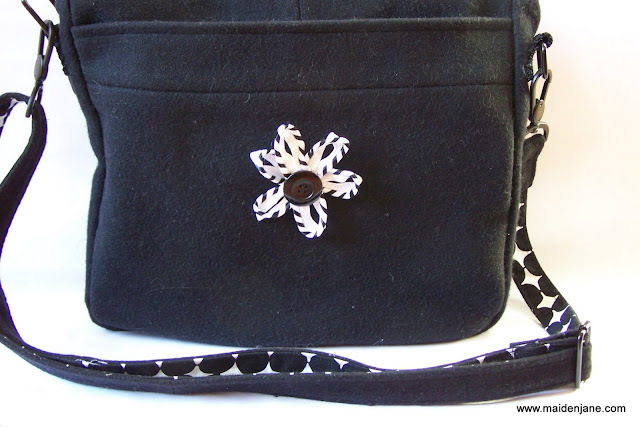 I edged the pocket and the top of the bag with a fun Simplicity trim of black and white stripes. I also made a flower out of the trim and button. Annie has informed me that she likes the flower, but it is lost in the center of the bag, so I will move it to a corner. The pattern has you sew on the purse rings on the side of the bag after that side is sewn onto the bag. I am not sure that is easy to do. 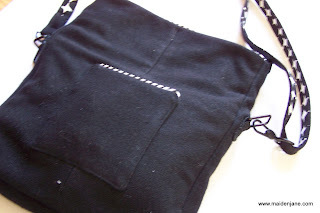 And I know it is impossible to do with my Janome, so I sewed that on first. 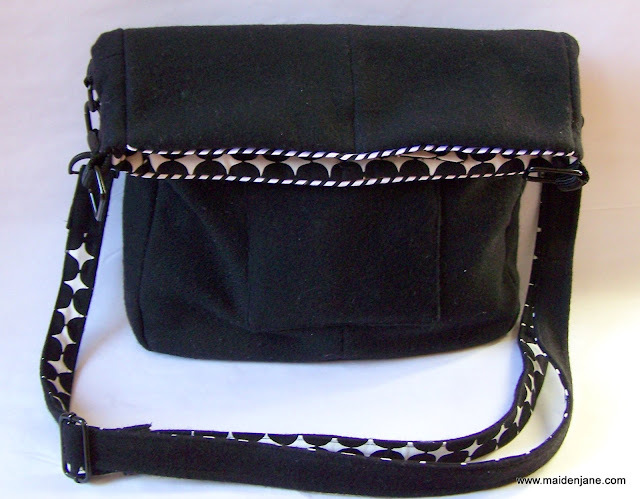 On the inside, I used some leftover fabric from Contemporary Cloth. I added a bunch of pockets. A pleated one for my wallet, small ones for my small stuff. After sewing on some of the pockets I removed them because I realized that I should not have a pocket where the bag is going to fold over. So I lowered all the pockets and kept one small one at the top for when I use the bag that way. It took two engineers to figure out how to make the adjustable strap. 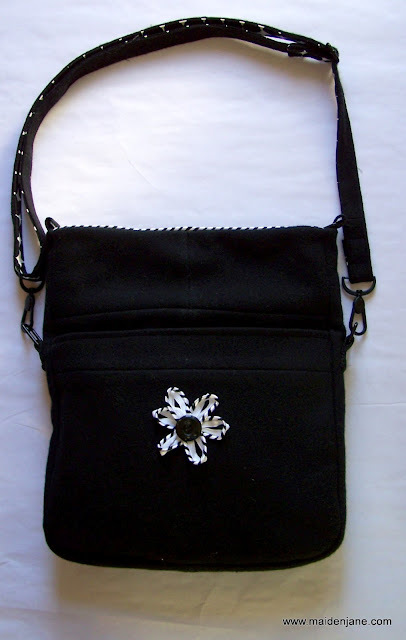 I made it very long so that it could be work cross-body like a messenger or small, as a purse. Don’t try to turn a tube inside out that is this narrow and make out of wool! I am currently using this bag as a purse. If I need to bring my laptop somewhere then I simply move the straps to the connections at the top of the bag and the laptop fits in perfectly. This was a challenging, but fun project. 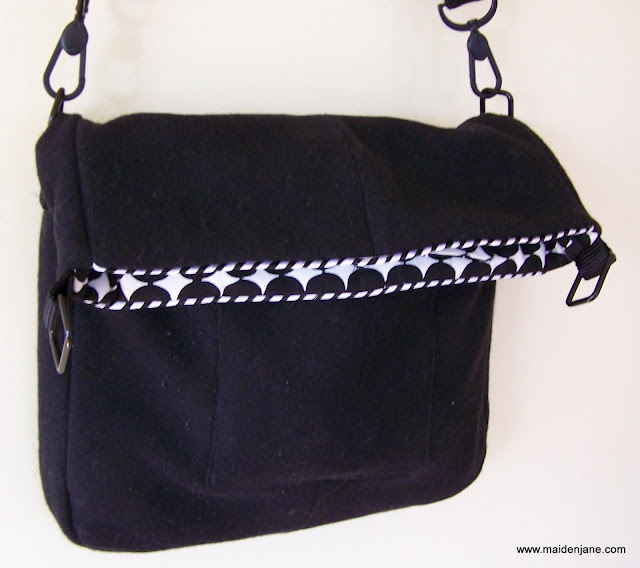 I learned some great ideas about purse construction and I salvaged the wool to make a durable bag. That’s a great idea! I have a coat like that. It’s a bit worn to donate, so I’ve been saving it. This is wonderful! You are so talented! I agree with Annie, I think the flower will be great on the corner. Love this! Love it! Great bag. I’m adding this one to my list of patterns to get. You are something else…if only you lived nearby ~ I would recruit a class full of young people that would love to learn this dying skill of sewing. Sara and her friends love to sew, but there is no-one around to teach them the skills that you possess…they do pretty well off the cuff…but when I see your creations, it makes me sad for this young generation, as she is much the exception and very few young people sew now days. I just love your latest creations! Keep them coming! I will never look at an old coat the same way again! Oh the possibilities! Oh so fantastic! Great that you were able to give your coat a new life. 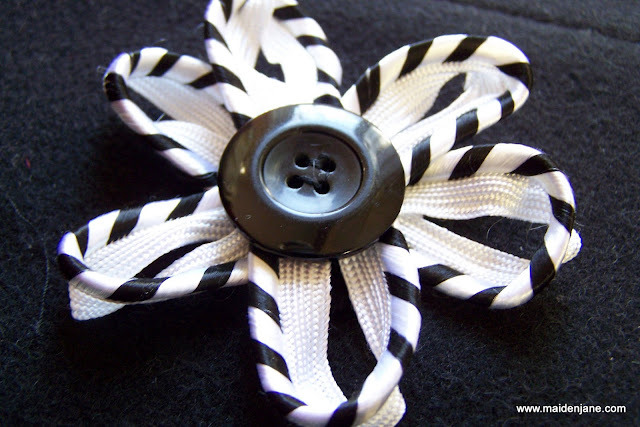 To a seamstress, everything is potential fabric!